FabricLovers Blog: Join the Party! To be entered in the Membership Giveaway, all you need to do is leave a comment below with your name and email so we can contact you if you win. This contest will be open until June 10; we'll pick the winner via random.org on June 11. Would love to be a member! A regular at CT and love their mirage fabric--the first colour used! 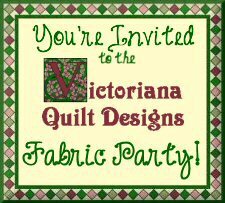 A Victoriana quilt designs membership would be fantastic. I have been following site for some time now and return often. A membership gets me more quilting how to and patterns etc. Thanks. A Fabric Party. Now how much fun can we have with this??? I want to join-in. I have been following you for years. It would be nice to have a membership! Oh yeah. Such good tips, I'm always wanting to learn new things. A membership would be nice to have. Love quilting, fabric, patterns and quilt blogs!!! I love your site. There are so many ideas and options! I would love the membership. She has some great patterns on the site that would be such fun. Thanks for the chance to win. That is one fo the first websites I found when I started looking online for ideas a few years back. Great resource! Thanks for the giveaway! I have been desperately looking for info about this and discovered your website via yahoo. It is undoubtedly one for my bookmarking! Keep up the good work I will pop back again soon. @Just Bedding Hi Just Bedding, Glad I could help!